The 1906-07 Stanley Cup Champion Montreal Wanderers engraved within the inner bowl. Women Engraved on Cup: Marguerite Norris (1954, 1955), Sonia Scurfield (Calgary, 1989), Marie Denise DeBartolo York (Pittsburgh, 1991), Marian Ilitch (Detroit 1997, 1998, 2002, 2008), Denise Ilitch Lites (Detroit 1997, 1998, 2002, 2008), Lisa Ilitch Murray (Detroit 1997, 1998, 2002, 2008), Carole Ilitch (Detroit 1997, 1998, 2002, 2008), Marie Carnevale (New Jersey, 2000), Callie Smith (New Jersey, 2000), Charlotte Grahame (Colorado, 2001), Nancy Beard (Detroit, 2002), Susan Samueli (Anaheim, 2007), Margaret Jacobs and Dale Hamilton-Powers (Boston, 2011) and Nancy Anschutz (Los Angeles, 2012 and 2014). 1937-38: Chicago Blackhawks - Pete Palangio's name appears twice, once spelled correctly and once incorrectly as PALAGIO. 1941-42: Toronto Maple Leafs - Turk Broda is represented twice, once as TURK BRODA and once as WALTER BRODA. 1946-47: Toronto Maple Leafs - Gaye Stewart is misspelled as GAVE STEWART. -- Alex Delvecchio's name is misspelled as ALEX BELVECCHIO. 1956-60: Montreal Canadiens - Jacques Plante won the Stanley Cup five consecutive years, his name is spelled differently each and every time. 1962-63: Toronto Maple Leafs - Misspelled as TORONTO MAPLE LEAES. 1971-72: Boston Bruins - Misspelled as BQSTQN BRUINS. 1974-75: Montreal Canadiens - Bob Gainey's name is misspelled as GAINY. 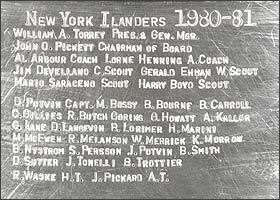 1980-81: New York Islanders - Misspelled as NEW YORK ILANDERS. 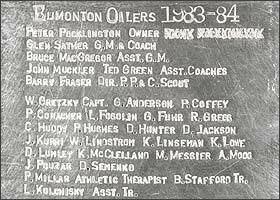 1983-84: Edmonton Oilers - Owner Peter Pocklington included the name of his father Basil Pocklington, who was unaffiliated with the team. The NHL learned of the move and ordered the name removed. The name is now covered by 16 X's. 1995-96: Colorado Avalanche - ADAM DEADMARSH was misspelled as ADAM DEADMARCH. It was later corrected - a Stanley Cup first. 2001-02: Detroit Red Wings - MANNY LAGASE was corrected to MANNY LEGACE. 2005-06: Carolina Hurricanes - ERIC STAAAL was corrected to ERIC STAAL. 2009-10: Chicago Blackhawks - KRIS VERTSEEG was corrected to KRIS VERSTEEG. The 1983-84 Edmonton Oilers engraving with the X'd out Bazil Pocklington. Of note: The Boston Bruins elected to engrave hard-rock defenseman Ted Green on their team's 1971-72 championship roster, even though Green had suffered a serious injury in the exhibition season and did not play that year. The 2016-17 Pittsburgh Penguins on the bottom ring of the Stanley Cup. 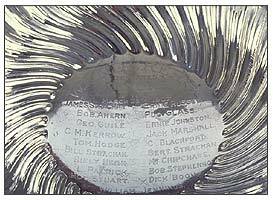 There have only been four official engravers of the Stanley Cup. The first engravers comprised of two generations of the Peterson family, with assistance from Fred Light Sr. They were followed by Doug Boffey, owner of Boffey Silversmiths of Montreal. The current engraver is Louise St. Jacques, who took over Boffey's engraving business and left the legacy of the shop's name in place. 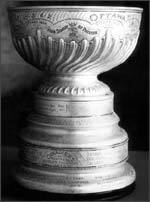 Click here for more information about the official engraver of the Stanley Cup.